*Venting Requirements: This unit requires venting pipe with an inner diameter of 2 Inches. Please see the Venting Components section on this page for venting pipe that must be used with this unit. Backdraft problems with your US Stove insert or stove? This US Stove 69FAK Fresh Air Kit may be able to help. You'll also need one of these kits if you want to install your US Stove appliance in a mobile home. I have a Model 2500 LN country hearth wood stove from US Stove company. Is this the correct air intake for it? Thank you. Yes, that is correct for a USSC 2500. Is this US Stove 69FAK fresh air kit 4" or 2" in diameter? This product uses 2 inch diameter air duct. Will the 69FAK work on a 2000 L wood stove? 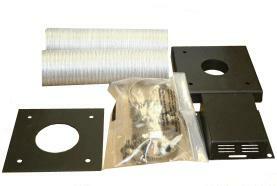 The 69FAK is indeed the correct outside combustion air kit for the 2000 model wood stove. We live in a mobile home after installing no more back-draft problems. Its a relief to open the stove door to add more firewood. ConsThere is no internal screen for the outside vent. The holes are large enough for ants, wasps,etc to enter. I purchased a metal screen at the hardware store and installed it.